Question: What is the Orthodox understanding of "imputed righteousness" in contrast with the Calvinist view? The Protestant reformers made much of their doctrine of justification by faith alone. We agree that justification is by faith... just not that it is by faith alone. What do we mean by "justification"? When Christians speak of being justified by God, we mean that we, who were once sinners, are made righteous by God. One important way that we differ from these Reformers (though not all Protestants) is that we believe that we are not simply declared to be righteous in a purely legal manner, but we are made righteous, and are then to work out our salvation in fear and trembling. We believe that if we become unrighteous, by living in unrepentant sin, we cease to be just in the sight of God. To remain justified, we must live a life of repentance, and a life in which the righteousness of God is lived out in our lives. "For what saith the scripture? Abraham believed God, and it was counted unto him for righteousness. Now to him that worketh is the reward not reckoned of grace, but of debt. But to him that worketh not, but believeth on him that justifieth the ungodly, his faith is counted for righteousness" (Romans 4:3-5). And so, we are told, the Patriarch Abraham's faith was credited to him for righteousness, and so they argue we are saved by faith alone. "Who against hope believed in hope, that he might become the father of many nations, according to that which was spoken, So shall thy seed be. And being not weak in faith, he considered not his own body now dead, when he was about an hundred years old, neither yet the deadness of Sarah's womb: He staggered not at the promise of God through unbelief; but was strong in faith, giving glory to God; And being fully persuaded that, what he had promised, he was able also to perform. And therefore it was imputed to him for righteousness. Now it was not written for his sake alone, that it was imputed to him; But for us also, to whom it shall be imputed, if we believe on him that raised up Jesus our Lord from the dead; Who was delivered for our offenses, and was raised again for our justification" (Romans 4:18-25). "By faith Abraham, when he was tried, offered up Isaac: and he that had received the promises offered up his only begotten son, of whom it was said, That in Isaac shall thy seed be called: accounting that God was able to raise him up, even from the dead; from whence also he received him in a figure" (Hebrews 11:17-19). "But wilt thou know, O vain man, that faith without works is dead? Was not Abraham our father justified by works, when he had offered Isaac his son upon the altar? Seest thou how faith wrought with his works, and by works was faith made perfect? And the scripture was fulfilled which saith, Abraham believed God, and it was imputed unto him for righteousness: and he was called the Friend of God. Ye see then how that by works a man is justified, and not by faith only [or, "alone," Greek "monon"] (James 2:20-24). St. James sites the same example of Abraham's faith regard the promise that by his son Isaac, the promise that God made to him would be fulfilled, and he uses the very same quotation from Genesis 15:6 ("And he believed in the Lord; and He counted it to him for righteousness"), and says that we are justified by works. So did St. Paul and St. James contradict one another? No, St. Paul does not argue that we are saved by "faith alone", and St. James does not argue that we are saved by works alone. It is interesting to note that in the entirety of Scripture, the words "faith" and "alone" appear together in only in the passage from St. James. In fact, St. James says that Faith and works, work together: "Do you see that faith was working together [synergei] with his works, and by works faith was made perfect [or completed]" (James 2:22). St. Paul does not contradict this, but in fact confirms it when he commands us to "work out your own salvation with fear and trembling" (Phil. 2:12). "But when the righteous turneth away from his righteousness, and committeth iniquity, and doeth according to all the abominations that the wicked man doeth, shall he live? All his righteousness that he hath done shall not be mentioned: in his trespass that he hath trespassed, and in his sin that he hath sinned, in them shall he die" (Ezekiel 18:24). "There is an element which derives from God, and another which derives from our own zeal. The one is entirely His work, the other involves striving on our part. However, the latter is our contribution only to the extent that we submit to His grace and do not surrender the treasure nor extinguish the torch when it has been lighted. By this I mean that we contribute nothing which is either hostile to the life or produces death. It is to this that all human good and every virtue leads, that no one should draw the sword against himself, nor flee from happiness, nor toss the crowns of victory from off his head" (The Life in Christ, trans. by Carmino J. DeCatanzaro, (Crestwood, NY: St. Vladimir’s Seminary Press, 1974), pp. 48-49). "O my plenteously-merciful and all-merciful God, Lord Jesus Christ, through Thy great love Thou didst come down and become incarnate so that Thou mightest save all. And again, O Saviour, save me by Thy grace, I pray Thee. For if Thou shouldst save me for my works, this would not be grace or a gift, but rather a duty; yea, Thou who art great in compassion and ineffable in mercy. "For he that believeth in me," Thou hast said, O my Christ, "shall live and never see death." If then, faith in Thee saveth the desperate, behold, I believe, save me, for Thou art my God and Creator. Let faith instead of works be imputed to me, O my God, for Thou wilt find no works which could justify me. But may my faith suffice instead of all works..."
"...Vouchsafe me, O Lord, to love Thee now as fervently as I once loved sin itself, and also to work for Thee without idleness, diligently, as I worked before for deceptive Satan. But supremely shall I work for Thee, my Lord and God, Jesus Christ, all the days of my life, now and ever, and unto the ages of ages. Amen" (Prayer Book, 4th ed., (Jordanville, NY: Holy Trinity Monastery, 2011), pp. p. 23f.). 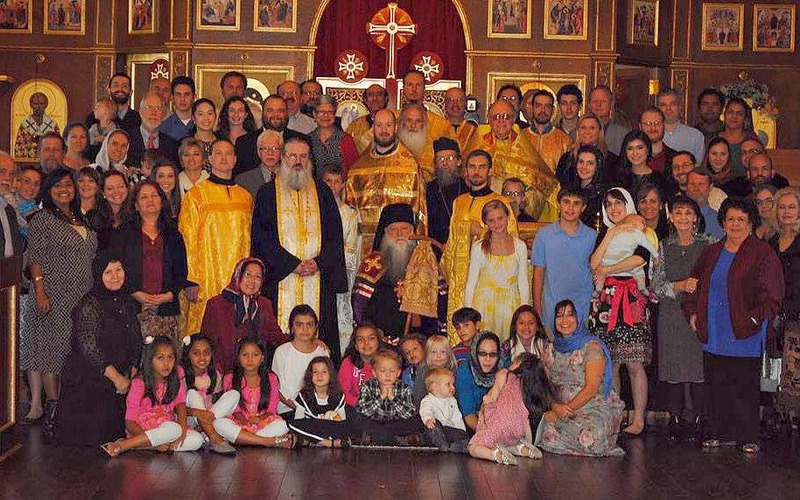 In short, the Orthodox Church strongly affirms that which is clearly taught in Holy Scripture: that we are saved by grace through faith—but not by faith alone. 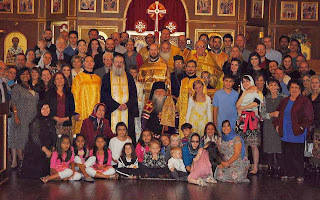 Our patronal feast is on October 20th, and this also was our 15th anniversary as a parish. We usually have Bishop Peter come at least once a year, but this is the first time he was able to be with us on the actual day of our patronal feast. The trio singing "Eis polla eti despota!" Stump the Priest: Does God Know the Future? Question: "Does God knows the future?" "Remember the former things of old: for I am God, and there is none else; I am God, and there is none like me, declaring the end from the beginning, and from ancient times the things that are not yet done, saying, My counsel shall stand, and I will do all my pleasure" (Isaiah 46:9-10). There are two issues that are raised with regard to the question of God's foreknowledge: 1). Does this mean that all things are predetermined by God? 2). Why then does God allow evil to happen, when He foresees it? Before we get to those two questions, however, we should consider the question of how God knows the future. Does He know the future because He makes it happen in a particular way? According to Orthodox theology, He knows the future because He is uncircumscribed, i.e., He is not limited by time or space. The Wisdom of Sirach says "His gaze spans all the ages; to Him there is nothing unexpected" (Ecclesiasticus 39:20). God sees the future, because He is not limited, is already in the future, and at the same time transcends time. "We ought to understand that while God knows all things beforehand, yet He does not predetermine all things. For He knows beforehand those things that are in our power, but He does not predetermine them. For it is not His will that there should be wickedness nor does He choose to compel virtue. So that predestination is the work of the divine command based on foreknowledge. But on the other hand God predetermines those things which are not within our power in accordance with His foreknowledge. 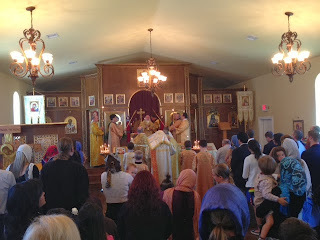 For already God in His foreknowledge has prejudged all things in accordance with His goodness and justice" (Exact Exposition of the Orthodox Faith, 2:30). For more on this issue, see "Dialogue on Free Will and Determinism." With regard to the question of why, if God knows the future, He does not prevent evil is essentially the same question you would have to ask even if God did not know the future, because one doesn't have to know the future to know that people with evil intentions will likely accomplish evil, if they are allowed to proceed with their plans unhindered. But in both cases, God would have to regularly violate our free will to prevent us from doing evil. For more on that issue, see "The Problem of evil". Question: "Did the Virgin Mary have a sister? Wasn't She the only child of St. Joachim and St. Ann? However, in the Gospel of St. John, it says "Now there stood by the cross of Jesus his mother, and his mother's sister, Mary the wife of Cleopas, and Mary Magdalene" (John 19:25). "ειστηκεισαν δε παρα τω σταυρω του ιησου η μητηρ αυτου και η αδελφη της μητρος αυτου μαρια η του κλωπα και μαρια η μαγδαληνη." You don't find any Church Father interpreting this text as suggesting anything other than that the sister in question is Mary the wife of Cleopas. This question plays an important role in the question of who the "brothers of the Lord" are, and whether the Virgin Mary was ever virgin, or whether she had other children by St. Joseph. One of the key passages brought up by Protestants that reject the Tradition of the Church on this issue is Matthew 1:25: "And [Joseph] knew her not till she had brought forth her firstborn son: and he called his name Jesus." First of all we must remember that the Bible was not written in English. The word translated "till" in this verse is the same word translated "until" (or "unto" in the KJV) in Matthew 28:20: "...And behold I am with you always, even until the end of the age." If we follow the logic of the Protestant argument in the first chapter of Matthew, we have to conclude that Christ will not be with us after the end of the present age. Also even in English, when we say "Joe refused to repent till the day he died," we obviously do not mean to suggest that he did repent afterwards. The point of this verse is plain. It leaves no room for doubting that Christ was not the result of relations between the Virgin Mary and St. Joseph—it says nothing about what happened thereafter, one way or the other. St. Jerome wrote a very detailed treatise on this subject that one can find in several readily available translations—it is titled "The Perpetual Virginity of Blessed Mary". Not only was this view held universally in the Early Church, but the Early Reformers all believed it. as did John Wesley. Nowhere in the NT does it say that the Virgin Mary and St. Joseph ever moved beyond betrothal. The Bible speaks of St. Joseph's "espoused" wife even when she was "great with child" (Luke 2:5) —but never mentions a marriage happening thereafter. In Jewish culture, a betrothal gave a couple all the responsibilities of marriage, but none of the privileges. Once betrothed, one could only break the betrothal with a divorce. Nevertheless, the couple was not permitted to have marital relations until after the public celebration of the marriage. "Then said the LORD unto me; This gate shall be shut, it shall not be opened, and no man shall enter in by it; because the LORD, the God of Israel, hath entered in by it, therefore it shall be shut." (Ezekiel 44:2). This has always been interpreted by the Fathers of the Church to be a typological reference to the Virgin Mary and the Incarnation. When we consider that God took flesh from the Virgin's womb, it is not difficult to imagine that this womb would remain virgin. If God would not allow men to pass through an earthly gate because God had entered in by it, how much more would this be necessary when speaking of the womb by which God became man? Why then did the Virgin need St. Joseph? That question is valid even if one believes she had other children later -- why did she need St. Joseph to give birth to Christ. The answer is obvious: virgins do not as a rule give birth, and Christ would likely have grown up an orphan had he been born to a single mother, because she would have been stoned to death as an adulteress. Of course God could have constantly intervened to protect her and her Son, but that is not normally how God operates in history. But Protestants object: "Mary had other children. James is called The Lord's brother. The brothers and sisters who came for Jesus while he was teaching are not cousins as Catholic's claim, like there is no Greek word for cousin." There is a Greek word for "cousin," but there is no Aramaic word for "cousin," and this is the language Christ and the Apostles spoke. In Aramaic (and also Arabic) if you want to precisely refer to a cousin, you would have to say "the son of my uncle," or "the daughter of my aunt". But such circumlocutions do not roll off the tongue, if, for example, you are calling out to your cousins "Hey, sons-of-my-uncle! Come here!" So instead, in Aramaic, the word "brother" or "sister" can be used in reference to kinsmen. It is extremely unlikely that the Virgin Mary had another sister from the same parents who was also named Mary (John 19:25). And so clearly the term "sister" is being used in some broader sense. What is also very interesting is that this Mary, who is not Christ's mother but who also just happens to be the Virgin Mary's sister, also happens to have kids with the same names as Christ's brothers. See: Matt 27:56, Mark 15:40, 16:1; Luke 24:10; John 19:25. The Matthew account has Mary the mother of James and Joseph. Mark has Mary the mother of James the Less and Joses. John has "his mother and his mother's sister, Mary the wife of Clopas". All accounts mention Mary Magdalene separately and Matthew mentions the mother of the sons of Zebedee (who could not also be married to Clopas). This suggests that Mary the wife of Clopas, who is Mary's sister, is the mother of James and Joses, etc. The Apostle James, the Son of Alpheaus is not necessarily the same as James the less. They are not connected in the Gospels, though this connection is possible. James the less was the son of Cleopas, but, it is possible that "Cleopas" is a variant Hellenized transliteration of the Aramaic name "Chalphi". Then we have the very early testimony of Hegesippus who states plainly that the brethren of the Lord were the Children of St. Joseph's brother Cleopas and his wife Mary. .
"After the martyrdom of James and the conquest of Jerusalem which immediately followed, it is said that those of the apostles and the disciples of the Lord that were still living came together from all directions, with those that were related to the Lord according to the flesh (for the majority of them also were still alive), to take counsel as to who was worthy to succeed James. They all with once consent pronounced Symeon, the Son of Cleopas, of whom the Gospel also makes mention [note the Gospels only list Symeon as one of the Brother's of the Lord], to be worthy of the episcopal throne of that parish. He was a cousin, as they say, of the Savior. For Hegesippus records that Cleopas was a brother of Joseph" ((Eusebius' Ecclesiastical History 3:11) note: Hegesippus was a 2nd Century Palestinian Jew. Eusebius preserves one of the few fragments left of his works, since he had access to the great library of Ceasarea and of Alexandria—the contents of which were mostly lost later). 9. July 17, 2013: Stump the Priest: Mass Ordinations? 7. 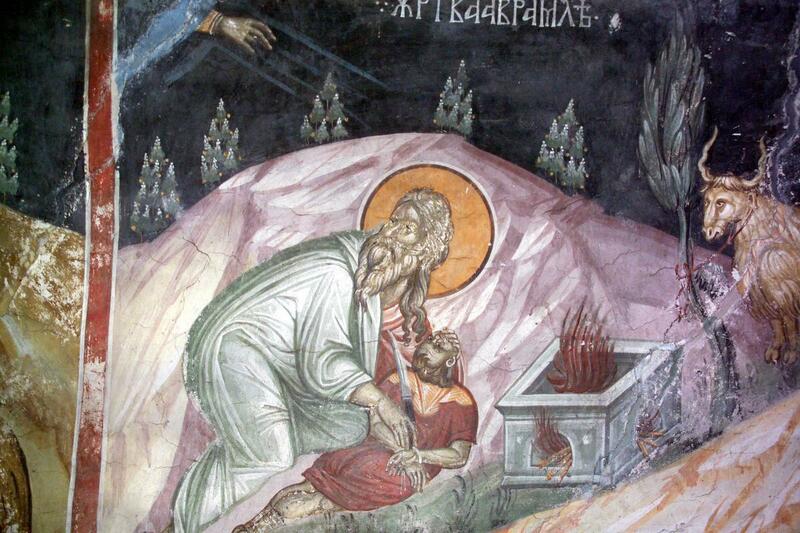 June 26, 2013: Stump the Priest: What About the Violence in the Old Testament? 4. September 23, 2013: So Gay Marriage Won't Impose Anything on the Rest of Us? 2. 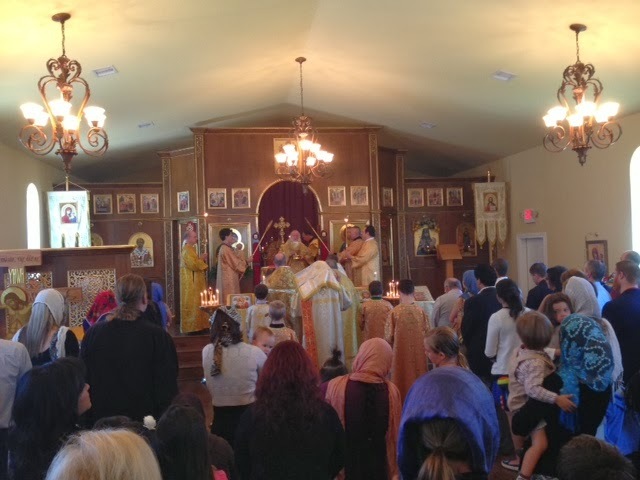 November 29, 2013: What should Orthodox Christians do, when there is no parish nearby? 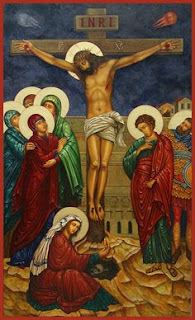 August 23, 2012: Homilies on the Lord's Prayer. And what is curious about the number 1 post is that no other posts have even come close in terms of the number of hits. It is interesting to see which posts keep getting read over time, and I never would have expected the post on the Lord's Prayer to be especially popular. The Story of Sgt. MacKenzie is another one that I would never have guessed at, but it is a good story. Question: When you provide answers to questions, this can be very helpful, but instead of just giving us fish, teach us how to fish. How do you go about getting the answers to the questions? It depends of the type of the question, and so it is too broad to answer generally, but I will try to answer it in terms of questions that relate to the Scriptures. First, it helps to be generally acquainted with the context. If you have read the Scriptures regularly, when a question arises about it, you will already have a good idea about where in the Bible that issue is addressed, and of the context relevant to those passages. It is also important that you understand that when one begins reading the Scriptures, it can seem very difficult, but the more you read, the easier it will become. For some pointers on how to begin reading Scripture, click here. Reading the lives of the saints, and the writings of the saints and fathers of the Church on a regular basis will also in turn help you to better understand Scripture. How do you go about studying a passage of Scripture? 1. Define the limits of the text you are looking at. What is the reason for considering this passage to be a textual unit? Why should it start at the verse you began with, and why should it end with the verse you conclude with? This may seem unnecessary, particularly if you have a modern translation that usually breaks up the Scriptures into sections, but it is important to know when one section begins and ends because context is important, and when looking at the context, the immediate context is an important level of context that you need to be aware of. 2. You need to look at the historical Context of the book that this passage is found in, who wrote it, who was it written for originally, and how might these factors shed light on the text. You can get this information from a variety of sources. A good edition of the Scriptures has an introduction to a book of the Bible that will give you the basic answer to this question. Biblical histories, commentaries and Biblical introductions are also very helpful. You can read more about these kinds of resources by clicking here. 3. You need to make sure you have a good translation of the text, and do some digging to find out the meaning of any significant words, or obscure grammatical constructions in the text. Obviously, having a familiarity with the original languages would be a big help, but even if you don't you can get a good understanding of this by doing things like comparing translations, and making use of things like Bible dictionaries, commentaries, and also some electronic tools that help you better understand the words that are behind the translation. The link on Biblical Reference Texts will again be of some help, as well as this link on electronic tools that are available online for free. 4. It is important to keep in mind the genre of the passage of Scripture you are looking at. Is this an Epistle? A parable? Historical Narrative? Poetry? A prophecy? A hymn? You can't read a hymn the same way you would read a historical narrative, or an epistle. Each genre has particular functions, that have to be understood. 5. The wider context: You need to understand how the passage you are looking at fits within the larger book that it is contained in. You also need to look to see if there are other passages of Scripture that shed important light on the passage. 6. You then need to look at how the passage has been understood by the Church. How do the Fathers apply this text in their context, and based on the principles you see at work there, you need to ask how we should apply it in our context. It is helpful also to see if you can find any useful insights from more contemporary Orthodox writers. You can find some texts of the Fathers online, as well as a lot of more contemporary Orthodox texts that may be helpful. You should also try to build a good library for yourself and your family. In short, becoming familiar with the content of Scripture, learning how to use good reference tools to dig deeper into the text, and having a good spiritual life in general and learning to put what you learn into practice are the keys to being able to find the answers you are looking for. The Fathers tell us that there are obscurities in Scripture because this keeps us humble, and makes us hungry to dig into it deeper. If everything was stated so plainly that the meaning was always obvious, we would probably not study it very diligently, but by our nature, we value more that which comes to us with difficulty and effort. So if you don't understand everything in Scripture, that is OK. God placed lots of low hanging fruit in Scripture that is easy for even a beginner to grasp, but he also buried a lot of treasure, and no one ever exhausts that treasure. So if after doing all the digging you can, you still don't have the answer you are looking for, you can always ask someone who is better versed in Scripture. But if even these people don't know the answer, just know that there is an answer, and if it is important for you to know it, God will eventually reveal it to you. If you take as an example the article I wrote on unicorns in the Bible. The first thing I did was use an online concordance to find all the places in Scripture that mentioned them. Then I looked up "Unicorn" in some Bible dictionaries I have. I looked at some Greek and Hebrew lexicons (I have some good hard copies, but you could find similar electronic sources by using the E-Sword program discussed in the Computer Based Bible Study article. I also Googled the Greek and Hebrew words to find articles on the subject that provided a lot of useful information. Then I looked at patristic commentaries that I have on the passages that mention unicorns, and then put it all together. A Simple Approach to Reading the Entire Bible. An Orthodox Guide to Translations of the Bible. A Guide to Biblical Reference Texts. Call your representative and your senators about what is going on in Syria. Call your local talk show hosts. Do what you can to get America to pay attention to what Obama's "Rebels" are doing in Syria. Communities that have been there since the days of the Apostles, and which have preserved the language Christ and the Apostles spoke, and so much of the history of our Faith are being destroyed before our eyes, and we have the added responsibility of having our elected government playing in crucial role in supporting the Jihadists. If you have a soul, please help, and make people aware of what is happening.